Two runners were seriously injured when they fell into the same Lake District gill in separate incidents on the same afternoon. A man suffered head injuries when he fell more than 160ft while taking part in a mountain marathon in the Lake District. The Warrington man fell into Dubhow Gill on Angletarn Pikes on Saturday. Patterdale Mountain Rescue Team was called out and the Great North Air Ambulance was scrambled about 3.30pm. It took the crew members about 25 minutes to make the climb to the injured runner, a competitor in the Saunders Mountain Marathon. The spokesperson said: “When they reached the casualty the team assessed and treated a young male for injuries to the head and face. The man also suffered leg and arm injuries in the 50m fall into the gill. His condition was described as stable when he arrived at the specialist unit in Preston after the 20-minute flight. A Patterdale Mountain Rescue Team spokesperson said: “Just as the team had returned to base they were called out again to a second incident in exactly the same location. “This time a female fellrunner had taken a tumbling fall with a suspected fractured arm, back and chest injuries along with lacerations to her head. 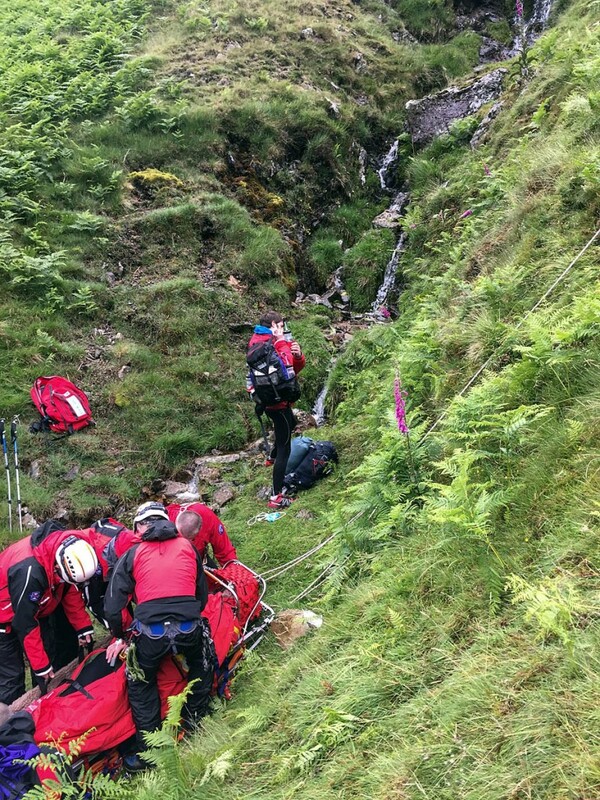 The two rescues took six hours in total and involved 14 team Patterdale MRT volunteers. Well done "mountain Rescue" donate when ever you can. Steph (my sister in law ) and I were in the same race, Saunders Mountain Marathon. Our understanding is that both runners who were rescued are OK although stitches and a broken arm were sustained. The ground mountain rescue team. How reassuring it is that these, mainly volunteers, enable us to enjoy the mountains. I second that. Well done MRT. Fingers crossed for quick recovery for those injured. "How reassuring it is that these, mainly volunteers, enable us to enjoy the mountains." Not sure this 'hint of a service' is quite the correct sentiment.